Unlike the Shield dwarves, the gold dwarves maintained their great kingdom in the Great Rift and did not decline in terrible wars against evil humanoids. While they practices some magic, they never acquired the hubris that caused the downfall of some human nations. Confident and secure in their remote home, the gold dwarves gained a reputation for haughtiness and pride. Since the Thunder Blessing, many young gold dwarves have left the Great Rift and are exploring the rest of Faerun. The folk of other lands have learned that while some gold dwarves are aloof and suspicious, for the most part they are forthright warriors and shrewd traders. * Ability Adjustments: +2 Constitution, -2 Dexterity. 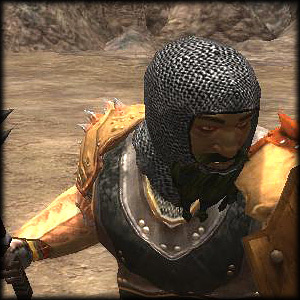 * Weapon Familiarity: Dwarven waraxes are treated as martial weapons, rather than exotic weapons. * Hardiness vs. Spells: +2 racial bonus to saving throws against spells and spell-like effects. * Battle Training vs. Giants: +4 dodge bonus to Armor Class against monsters of the giant type (such as ogres, trolls, and hill giants). * Battle Training vs. Aberrations: +1 racial bonus on attack rolls against aberrations. * Favored Class: Fighter. A multiclass gold dwarf's fighter class does not count when determining whether he takes and experience point penalty for multiclassing. Dwarven culture extols the virtues of battle, and the vocation comes easily to dwarves.